Flush skin with plenty of water for at least 15 minutes while removing contaminated clothing and shoes. Get medical aid if irritation develops or persists. Wash thoroughly after handling. Wash hands before eating. Use with adequate ventilation. Avoid contact with eyes, skin, and clothing. Exposure Limits CAS# 921-53-9: Personal Protective Equipment Eyes: Wear chemical splash goggles. Solubility in water: Soluble in water. Carbon monoxide, irritating and toxic fumes and gases, carbon dioxide, oxides of potassium. 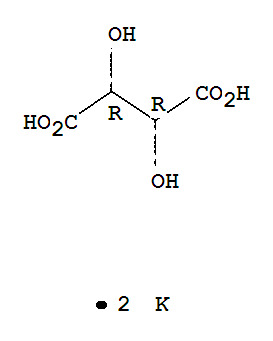 Potassium (+) Tartrate - Not listed by ACGIH, IARC, or NTP. Products which are considered hazardous for supply are classified as Special Waste and the disposal of such chemicals is covered by regulations which may vary according to location. Contact a specialist disposal company or the local waste regulator for advice. Empty containers must be decontaminated before returning for recycling. CAS# 921-53-9 is listed on Canada's DSL List. CAS# 921-53-9 is not listed on Canada's Ingredient Disclosure List. CAS# 921-53-9 is listed on the TSCA inventory.